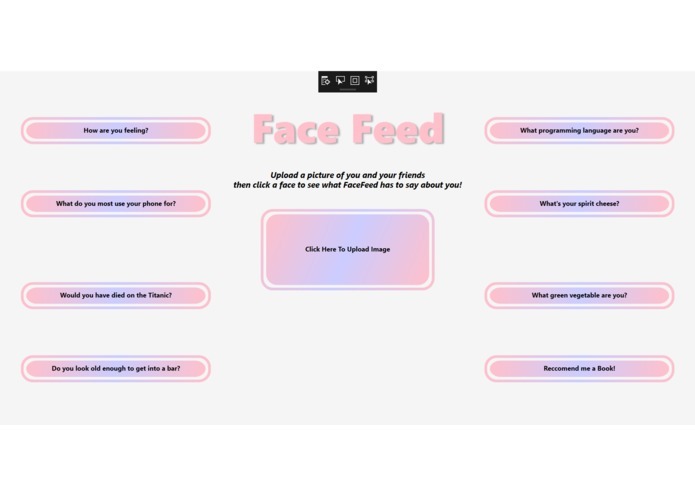 A BuzzFeed quiz, but with your face. We thought the power of facial recognition software was immense. We also realized that people love things like Buzzfeed quizzes, horoscopes, and other frivolous ridiculous fun internet randomness. Since we wanted to learn the Cognitive Face API, we thought this project would serve as a great way for us to have fun with an awesome API and bring its power to people who might not otherwise get to use it. First, the user uploads a picture to FaceFeed. Then, FaceFeed uses Microsoft's Azure Cognitive Face API to analyze your face. Finally, FaceFeed produces buttons you can click that will tell you things about yourself based on how you look in the picture. 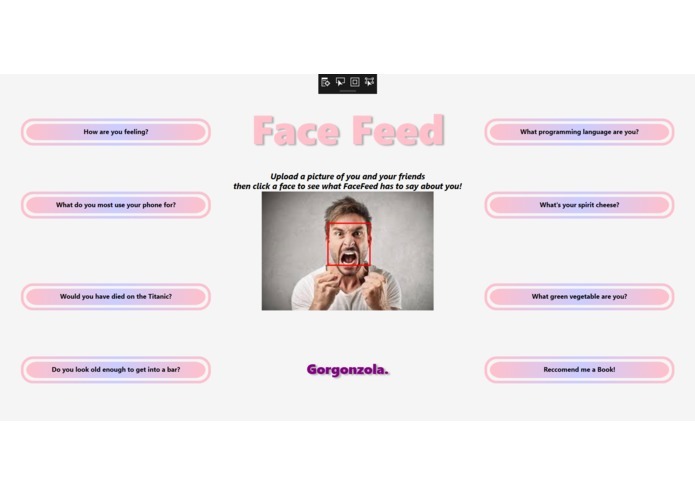 We built this program using the Microsoft's Azure Cognitive Face API to create a wpf that returns information about age, gender, and emotion based on the image of a face. We then used this information and other statistics to present the user with data about how likely they were to do or enjoy certain activities, and fun random correlations. We didn't know C# or xaml formatting, and had never developed a wpf before. We both learned two new languages, and successfully implemented a complex API. We also had a lot of fun, probably the most fun out of anyone here.